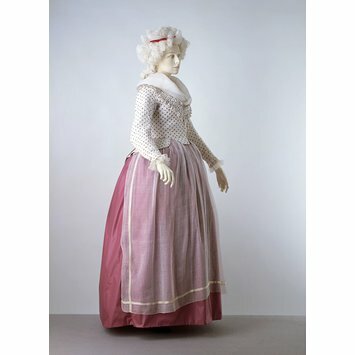 In the 1780s jackets worn with petticoats became a popular garment for informal wear by women. This example shows the long sleeves and close-fitting style characteristic of the decade. It is made of linen printed in a repeating pattern of floral sprigs. The fabric has been quilted so that each printed motif is framed in a diamond shape by quilting stitches. 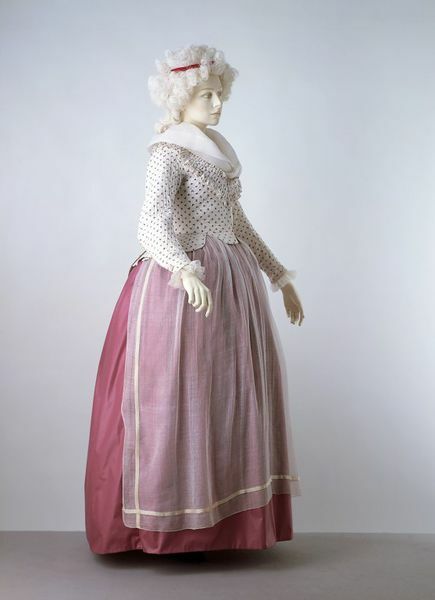 A decorative cotton muslin apron completes the ensemble. Jacket of printed linen with an all-over pattern of a small lilac sprig in an alternating design of flowers, fruits and berries. The jacket is quilted in running stitch in a diamond pattern. The jacket is hip length with a low round neck trimmed with a gathered frill of self-material and fastens down the centre front with hooks and eyes. The sleeves are long and fasten at the wrist with a small self-covered button. It is shaped to the figure and tails flair from the waist at the side, and are overlapped at the centre back by a longer one in a lozenge shape. Lined with linen.